No Installation View image to display. The retrospective of any artist who has consistently been at work for over five decades, is no longer about the artist per se. It also becomes the narrative of a nation, a region, a school, a style. His retrospective then, becomes the occasion for an archaeological exploration into the multiple layers of social, historical and aesthetic accumulation that reveal themselves, as clearly as strata in stone. As a leading contemporary modernist of post-Independence India, S.G. Vasudev’s work takes us into the thick of the debates and turmoil in the sixties within the College of Art, Madras – a pioneering centre for arts education that has received the least critical attention from our art historians. The products of the Madras art movement have, thus, remained confined to the margins of the narrative around mainstream Indian art. This is an injustice that needs to be swiftly corrected. 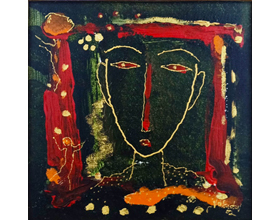 Vasudev’s work reveals the creative churn among the students and teachers at the Arts School in the mid-sixties. The reputation of the school attracted students from all regions of the sub-continent – Bengal, Gujarat, Bombay, Andhra, Karnataka, Kerala and, of course, Tamil Nadu itself. It helped generate its own form of inter-culturalism. 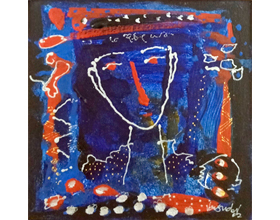 And an eclectic art practice grounded solidly in the play with line and surface, significantly integrated from the prevailing practices of ordinary people on the street and traditional artisans. An exposure to Vasudev’s collected work brings us to the centre of these preoccupations with evolving a local, native vocabulary that was, in itself, a critique of Western canons of spatialization and depth. Inspired by the critical indigenism of their mentor K.C.S. Panikker, Vasudev and a group of graduates of the Madras Arts College dared to break away from the then urban conventions of modern arts practice and create Cholamandal, an arts village on the outskirts of Madras. In the mid-sixties, this was a radical move. 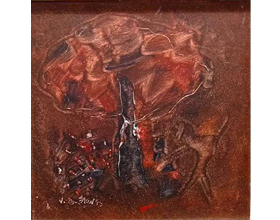 The subsequent five decades has seen Vasudev go through distinct periods with specific themes – Maithuna, Vriksha, Tree of Life, Tree of Life & Death, Humanscapes, Earthscapes, Theatre of Life, She and He and Rhapsody – a journey that defines his preoccupations with relationships, transience, nature and ecological concerns, performative aspects of life and the fire of desire. 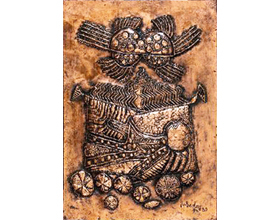 He is now among a distinguished group of senior Indian artists whose work is much sought after and part of many important collections. 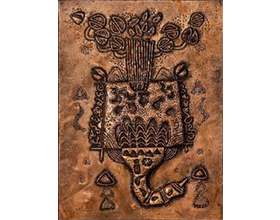 While the artist has stayed rooted to the medium of oil on canvas and drawings, he has also made significant departures in media like copper plates and tapestry, bringing a new dynamic within these. The comprehensive retrospective of Vasudev’s work mounted at NGMA, Bengaluru, during September 2018, had a distinct curatorial and design plan. 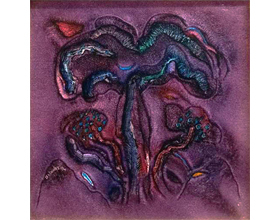 Bringing together over 400 works by the artist, including some from the collections of the NGMA and private collectors, the retrospective mapped the inner rhythms that motivate the artist’s expression – much of it triggered also by his deep response to classical Carnatic music – and a sustained, spiralling resonance which, like a musical cycle, keeps returning to sama, before it spins off into the next avartana. A substantial selection from this retrospective is now being presented – spread across three venues – in Chennai. Opening on January 27 at the Lalit Kala Akademi, it will also be parallelly mounted at the Forum Art Gallery and at Cholamandal. The exhibition, lasting three weeks, will be accompanied by a series of curated events in music, dance, theatre, film screenings and discussions.